Allspice is native to Southern Mexico and Central America. It is now grown predominantly in Jamaica and at one time was forbidden to be exported. The name “Allspice” was coined by the English who noticed the aroma was reminiscent of cinnamon, cloves, and nutmeg. Ancient Mayans would embalm passed rulers with allspice, holding the berry in high esteem. Allspice has warming properties which improve blood circulation and calm the nerves. It is reputed to act as an aphrodisiac. For cosmetic applications, allspice essential oil acts as an astringent, constricting the skin and tightening pores. Its pain reducing properties are attributed to its eugenol content, helping to relieve arthritis and other muscle related pains. Allspice is wonderful to use in aromatherapy in addition to incorporating in beauty and personal care formulations. A warm scent with therapeutic properties certain to please. "The results show that apple-based films with allspice... [is] active against 3 foodborne pathogens by both direct contact with the bacteria and indirectly by vapors emanating from the films." "The results show that the essential oils possess significant antioxidant activity which is comparable to that of pure eugenol. Therefore the oil can be utilised as a natural antioxidant which gives good flavour as well as health benefits." "Allspice essential oils also have been substituted as a natural alternate for pesticides and fungicide." "Allspice essential oil, when added to massage oils and baths, is known to promote circulation so as to relieve pain from muscle cramps and strains. Also, it is used for headache, to combat stress and depression and to overcome fatigue because of its comforting scent. Allspice blends well with ginger, lavender and other spices, making it diversified when it comes to the choices for aromatherapy." "The reason why Allspice is used for treating indigestion might be due to the abundance of the common polyphenol Eugenol in Allspice, which is known to stimulate digestive enzymes." "The biological properties exhibited by Allspice extracts can be loosely classified as oxygen scavenges (antioxidants), vasodilators (antihypertensive) and antiproliferative agents with potential for application in cancer chemoprevention and therapies." "We have presented a critical evaluation of its medicinal properties with special attention as a chemo-dietary prevention agent for chronic diseases and malignant cancers." "Opportunities exist to identify several potential anticancer compounds from Allspice and test their bioavailability and mechanism of action on normal and tumor systems." I love spicy oils and this one smells great! The Perfect Addition to my Collection! I love diffusing oils, especially in the winter, and this was the perfect addition to my collection. Smells incredible, very warm and inviting. Super happy I invested in it! I initially purchased a sample bottle because I wasn’t sure about it. Man oh man do I wish I had gotten a larger bottle! I love diffusing it because it makes the house smell warm and snuggly. It’s also calming and smells just like gramma’s kitchen during the holidays! I like the smell of this oil! Smells like a kitchen with yummy food baking in the oven. If you love warm spicy scents like cinnamon, or cloves. 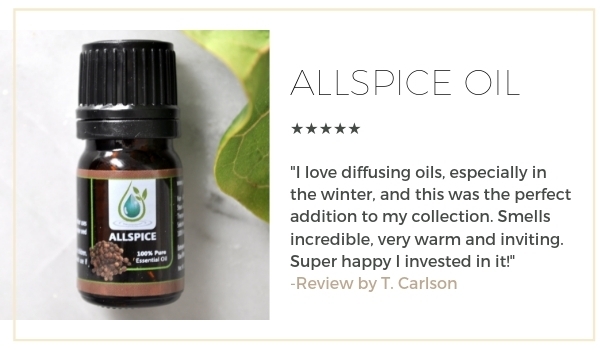 You will want Allspice in your oil collection. Great smell, just wish the bottle was bigger. I love, love love this. Great aroma. Ordered some from another company...This is MUCH better. One of my very favorite oils! I diffuse in my office and have people stop in & ask what smells so good! Love Jade Bloom Oils!! I LOVE this oil! Has a wonderful scent, diffuse it at work and get lots of comments, like..."What smells so good in here!" Lovely oil, smells just like the spice. This will be fantastic to diffuse in fall and throughout winter. I think you could really play with some lovely blends with this!